What do you do when you want gourmet sushi at a decent price? You head over to Lawrence Fish Market in Albany Park! A counter-serve, cash-only eatery that’s more about the thrills and less about the frills. Husband and wife couple Iida and Cindy personally oversee the restaurant, daily, to ensure that their unassuming, hole-in-the-wall type place keeps its customers happy. At our tasting, they were even nice enough to create a little table setting so that we could enjoy all the goodness, right there, as our platters of fish started rolling in. So we sat down with a yummy Aloe drink in tow ready to be WOWed! To start us off, Iida brought out a couple bowls of their Seaweed Salad and the Ika (Squid Salad). Seaweed is healthy for you anyway but imagine when it is packed with flavor in addition to nutrients. Always makes for a fine appetizer to a sushi meal, in my opinion. The portions were just perfect! The first batch of fish that came out was a platter of of every kind of sashimi imaginable. And every piece of that $1 salmon, tuna, hamachi, sweet shrimp and octopus I ate was of a melt-in-your-mouth consistency. The sauces and wasabi seemed irrelevant, which is a good testament to the freshness of the fish. And an example that price does not always equal quality. The presentation was gorgeous and even the wasabi was cute. The rolls began showing up, platter by platter and it’s always cool, when the first one you bite into ends up being your favorite one of the night. The Bonzai Roll (which is also their most popular roll, so I know there’s consensus on this), was marvelous! Shrimp tempura with tamago, avocado, masago, spicy mayo and cilantro was topped with tiny, pretty slices of jalapeno, crunchy garlic and chili. Guys, this was no ordinary roll. 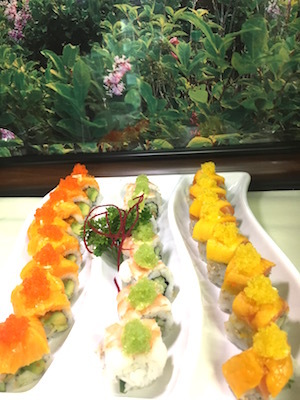 The Dreamy and the Moon Light Rolls both from their separate, specialty section of the menu, came also with a shrimp tempura but the former combined with tuna while the latter with salmon. There was a spicy mayo on both which did wonders to the roll. Each roll looked like a piece of art on the table; delicate, colorful and carefully crafted. The taste kept up with the appearance, which is not always the case with food. The Orange Sunshine Roll was fun and refreshing. The orange slices and yellow tobiko meshed so well together. Most people end with dessert, but we ended with a zing! The Kamikaze Roll was the grand finale and the chili oil on the spicy tuna toro made sure of it! Probably the first time in my tasting history that I genuinely did not have room for dessert, but the sweetness of the fish lingered in my mouth well into the next day. Like all other customers who had walked in and out of the restaurant throughout our tasting, we left with a cheek-to-cheek smile on our faces, happy, satisfied and immensely overwhelmed by the owners’ hospitality. If you haven’t been to Lawrence Fish Market, it’s a tragedy. My next whatever celebration will no doubt be catered by this restaurant, and the Combination Tray will be my pick! The Great American Lobster Fest returned to Chicago for a fourth year in a row and was held at Navy Pier for three consecutive guests. I was glad to cover as PR for the first time and experience first-hand all the lobster, all different ways. The weather was market and what better way to celebrate one last summer’s hurrah at Midwest’s largest seafood festival hosted by Green Curtain Events. So I took the day off and with a few friends in tow went to check it out. The location was perfect at the Far East end of the pier bordering the lake with booths lined up offering lobster delicacies such as Lobster Mac n Cheese, Lobster Grilled Cheese, Lobster Fries and a tent serving refreshing cocktails. Live music stations everywhere and a nice sized crowd. My favorite was the Lobster Roll I had that came with all the usual corn, potato and bread fixings, but the quality of the lobster itself was enough to kickstart my appetite and my love for everything lobster. I also got to make friends with some live lobsters. We ended the day of frolicking with some Cider Donuts and Peronis and left happy and full! If you missed it this year, you can plan ahead for the next one! Because this event sells out! A few of us foodies got to try Raisu together this month, thanks to Karen Lee of @ChicagoFoodStories, and it was one of the most amazing meals I’ve had in my life. A fine dining, stylish restaurant located in Albany Park, Raisu is a restaurant that flies its sushi directly from Japan, sometimes daily. You heard right! It just took fresh to a whole new level! Head Chef Simon was trained for seven years in just nigiri, so you can imagine the level of focus and passion that shines through the food. The quality of the fish is already spoken for, but the simplicity and flavors of each dish is what stands out! Chef Simon is less about the frills and more about preserving the taste of the fish itself and you can do that when the fish is so darn authentic. He does invest in garnishes, because each dish came with it's own unique garnish usually incorporating fruit. There was a pineapple one, which I still cant get over. 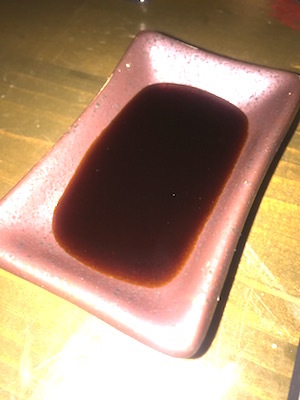 My favorites from the ten course meal we had was the Vegetable and Shrimp Tempura which came with a delectable Katsu sauce instead of the usual watered-down teriyaki sauce served on the side. I also loved being introduced to the Suzuki (Hamachi) and Sagoshi (Mackerel) nigiris, both of which were intensely tasty. We were urged to eat the nigiri with our hands, Japanese style, and it made the experience so much more fun. The Hokkaido Scallops were creamy good, and literally melted in my mouth. The Seafood Soup with crab and lobster in a sweet potato broth was phenomenal. The Blue Fin Tuna rocked my world especially knowing that it had been flown that morning from Japan. Pickled mushrooms on top were just the icing on the cake. And speaking of icing, we also got to celebrate our dear friend and pastry chef Sherrie Tan’s birthday with an uber-delicious Lemon Cake baked by Natty’s Pantry. I licked that chocolate ganache clean! We left home with more leftover cake and cute goodie bags comprising of fun Hello Kitty nic-nacs. What a fun event and great group of people to be sharing in this experience with. Now my only worry is how will I ever eat sushi elsewhere?! Seafood on the go is a new concept in Chicago, but a much-needed one for us pescetarians! That’s why I was very excited about the newly launched Seaside's to Go in Chicago. This carryout and delivery only place located in Lincoln Park can also deliver to your doorstep via Doordash, Grubhub or Seamless. Recently, I got a feast delivered for my friends and me; it was a Friday after all! For meat, my options were limited to the Grilled Lobster but that’s not a bad limitation to have. A beautiful looking whole lobster came in a box with the meat ready to be pulled out, pre-seasoned with the all the right spices and grilled to perfection. On the side, we had the Chopped Salad, Better Than Grandma’s Mac n Cheese and the Roasted Broccoli. All three were phenomenal and I especially relished the Parmesan chili flakes on the slightly charred broccoli. The dressing on the salad was noteworthy too. And just because it was takeout, I wasn’t going to skip dessert! The Coconut Cake was sweet and moist and everything a cake should be! Pescetarians, for those lazy evenings when you want gourmet seafood with minimal effort, Seaside To Go is your spot! Good fish and good prices; what more can one want?! If you’re going to brunch during football season, it needs to be at a Sports Bar that knows what it’s doing! My brunch tasting at Little Fort Tavern came just in time for NFL kickoff. I also didn’t realize that it was a Raiders/Hawkeyes bar, which was perfect because my guest went to Iowa. Not only was this a phenomenal tasting but also my foray into the world of the Hawkeyes. We were asked to arrive before the Sunday madness began and before the crowd trickled in, so we had the outside beer garden patio to ourselves for little awhile. This was perfect, in addition to the gorgeous weather we were having; it was as if all the stars were aligned just for our tasting. We instantly ordered their most popular drinks, the Summer Sunrise and Moscow Mules to get started. Our waitress validated our appetizer choices of their Fried Brussels Sprouts, Fried Pickles and Cheese Curds. Yes, we were on a fried food kick but it was Sunday after all! All three appetizers were the most epicurean, fried foods I’ve had. The perfectly crispy, deep-fried dill pickles were absolutely amazing and went well with the buttermilk ranch they came with. This popular Southern snack was a first for me, and could quite possibly become my new obsession. The cheese curds, their other popular snack item, were super tasty too. I am not a huge fan of falafel, but the Spinach Falafel on the menu just sounded good. I’m glad I didn’t pass up on it, because these tender, vegan patties were mouth-watering tasty and packed with tons of flavor. They sat on a nice-sized pita with generous dollops of a delicious cucumber/yogurt sauce. The Avocado Torta was my favorite, because I especially enjoyed the Asiago cheese layered on the inside of the torta. Plus the black beans, red onions, crema, salsa verde and Chihuahua cheese made for one delicious and piquant sandwich. It also came with tater tots on the side, and by now you can imagine that this restaurant knows its fried foods! I finally made my way to the seafood portion of the menu and tried the Shrimp Tacos. The plating on this dish will make you forget you’re in a sports bar. Zesty shrimp sautéed with black beans and shaved Fresno chilies came placed on tortillas with lots of avocado crema, which is also one of my favorite things in life. These also got devoured, fast. From the Brunch section of the menu, we tried the Breakfast Burrito (sans chorizo). While there’s many varieties of this American breakfast wrap, I loved the combination of the scrambled eggs, cheddar cheese and salsa verde here. All ingredients kept the flavors sharp, and everything tasted so fresh! The Cookie Skillet was the grand finale of our brunch, and was grandiose in every day. A giant chocolate chip cookie came out on a hot cast iron skillet, with heaps of vanilla ice cream, whipped cream, and chocolate syrup; it smelled like a chocolate factory. All entrée portions at this restaurant were substantial, and I could tell that every dish had been given some thought on ingredients and flavors. I was more than impressed and even got to bring leftovers home. I may have to become a Hawkeyes fan just so I have an excuse to brunch here every week! Thanks Little Fort Tavern for a super fun Sunday Funday! Fall decided to come a little early this year and fall weather always makes me crave ramen. The timing for my tasting at Kizuki couldn’t have been more perfect, plus I’ve been so eager to try it. Kizuki is located in Wicker Park and aims to serve ramen in the most authentic way possible. Even the noodles are prepared just like they are in Japan, in a special boiling method with absolute devotion to creating the best flavors in the broth. And the ingredients are imported straight from Japan. Ramen is not all there is to Kizuki; the restaurant features an array of Izakaya and rice dishes on their menu. So you can just imagine my level of excitement to try it all. As usual, I got to bring a guest! Owner Kevin Yu specially flew in for our tasting, I was so touched. He personally catered to all aspects of our dinner right from the start, and was able to give us a little more background about the restaurant’s philosophy. He started us off with a Sake flight and a delicious Saketini I requested, which I always find the perfect accompaniment to sushi. I was beyond impressed with the cocktail, sake and Japanese whiskey selection at the restaurant. It was almost overwhelming, but a good way! For Izakaya we had the Vegetable Tempura, Takoyaki Octopus Dumplings, Prawn Cutlet and the Geso Karage (squid tentacles). The deep fried tentacles tasted phenomenal especially with Japanese citrus and chili peppers,; similar to calamari in texture only a little more stringy and chewy. The tempura flour that the vegetables were fried in is also imported from Japan, and I could tell from the quality of the coating on the vegetables that this was no ordinary flour. The batter was crispy without being greasy, and it came with a smooth tempura sauce on the side for dipping. The dumplings were spectacular! Pieces of diced octopus shaped in a ball in wheat-flour based batter with aonori and a thick okonomi sauce and mayo. My favorite were the Bonito flakes (dried fish shavings), which were so light that they were literally moving with the hot steam. I was mesmerized! The Prawn Cutlets were delicious too, especially with the Tonkatsu drizzle. No doubt the tasting had started off grand. The Umeshu (Japense Plum Wine) was then brought out to cleanse our palettes and was perfect for the ramen adventure we were about to ensue. I was limited to the Vegetable Ramen because I couldn’t do the pork broth used in most others. But that was no compromise. The kelp stock worked just as well and the shitake mushrooms, miso, sesame and soy sauce made for a super tasty and addictive bowl of hot noodles. Plus I was promised that a seafood ramen is in the works to make its way to Chicago from Japan soon. So I’ll be patient until then! My guest went for their most popular Garlic Tonkotsue Shoyu Ramen and by the look of it and the look on his face, I knew it was killer! I could smell the garlic before it even made its way to our table. I loved that the ramen has zero preservatives or additives, is made in a unique technique, and upheld all the authentic Asian flavors one looks for in good ramen. You will be deeply satisfied, is all I can say. Kevin really left no stone unturned for our tasting and made sure we got the full flair of the restaurant and its offerings. Great location and all-around vibe with all servers ready to assist! What an amazing dining experience.! I absolutely cannot wait to go back! Having grown up in a developing country, I always value restaurants that don’t waste food. So I applaud Lowcountry and owner Pan for incorporating the concept of re-purposing seafood “waste” into delectable items. My visit there recently was specifically to try some of these items, but of course we didn’t limit ourselves to it. The Lowcountry Limeade is non-negotiable for me when I’m at this restaurant. Also their most popular drink, it’s a medley of Ford’s gin, lime, brown sugar and basil. I can’t even begin to tell you how tasty it is because it wouldn’t be fair, but its amazing! 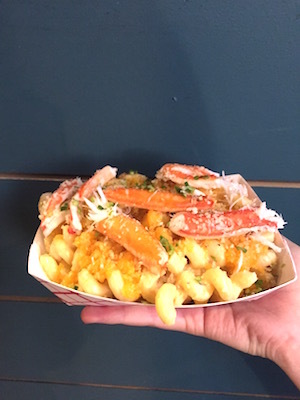 The Crab Hush Puppies and the Snow Crab Mac n Cheese both showcased how the succulent claw, knuckle and shoulder meat can all be tasty additions to a dish. Both were phenomenal! Since soft shell crab season only goes until the end of the summer, I’m glad we were able to get an order in! Fried until crispy, the tasty crab is served with sautéed jalapenos and dusted in garlic and pepper, and is ultimate deep fried goodness. The Honey Butter Jalapeno Cornbread was for pure indulgence, I admit. But it was oh-so-scrumptious! How do they get it so moist and so perfect, I wonder?! We ordered three bags of the boil, the Snow Crab Legs, Clams and the Shrimp (HeadOn) in their ‘Everythang’ sauce, garlic sauce and Cajun sauce, respectively. It came with the usual corn and potatoes too which makes for a hearty meal. At the restaurant, you’re literally spoon fed; even the bags were cut by the servers for us as the table was being constantly cleared of our shell buckets. The attention to detail at this restaurant is impeccable. Everything in the seafood boil was utterly and entirely delicious, but the highpoint for me this time around was the clams. I didn’t realize that these little molluscs lock in the flavor so nicely, and managed to capture the garlic sauce within its shell to marinate the meat further. I definitely ate more than my share and went as far as dipping some of that cornbread into any remaining sauce. I licked and slurped my way through the rest of the bags until I was ready to explode, but not without making a little room for the Powdered Beignets which were brought out with a side of Pumpkin sauce by the way. I have never been so happy from being so full and part of my joy was the good news that a location is being opened up in my hood, in the South Loop, soon. If you want to embrace the culture of community eating involving seafood with a Southern touch, head on over to Lowcountry! The Dana Hotel & Spa located downtown got a makeover, and I attended its very unforgettable celebration. Guests were given masks at the entrance to keep the #DanaUnmasked theme going. Some mysterious fun trying to recognize people with their masks on! All three artful spaces, the new Portsmith Restaurant, The Levinthan and Apogee Lounge featured fun bites and mystical cocktails throughout the night. Portsmith is a chic, seafood restaurant on the first floor, with a beautiful, nautical space. I was blown away by all the seafood around me, and completely in my element. Big bowls of raw seafood from shrimp, crab and oysters placed everywhere, and fun appetizers such as the scallops and crispy shrimp were passed around for guests to try. At one point I looked down at my plate and it looked like the sea! I absolutely can’t wait to go back for a full flare of all their seafood goodness. My guest and I made our way up to the Leviathan, named after a mythical sea monster which continued the marine theme via their drinks; with darker garnishes imitating sea dragons and monsters. The namesake Leviahan itself was quite phenomenal with a Bruichladdich Botanist Gin and shaved bonito flakes dust which was very unique. Finally we headed upstairs to Apogee Lounge, which was buzzing with energy. Being the last of beautiful summer days, everyone was huddled on the gorgeous patio, and we joined in too. The Deep End seemed to be the popular drink choice with Monte Alban Tequila, Grapefruit, Lime Watermelon, Chardonnay and Blue Curacao! Some really fun eats here too such as the Swordfish Pastrami Bocadito which came on caraway rice crisps, and The King Crab Bao Buns which quite likely were my favorite from the whole night. I got to see some familiar faces, mingle, and tour more than one spot, all in one night! What more could one ask for a Thursday night?! Check out the new Dana Hotel soon. It’s a world within itself, and with a little advantage to us pescetarians. My second visit to this fresh trout farm did not disappoint. In fact, it was an even more enjoyable experience given the warmer weather and the exceptionally beautiful day we were having that day. My guest and I took a road trip this month to visit the fishery for a more in-depth tour, and sampling of the new menu at the fisheries seafood restaurant, The Trout; the place to go for a true farm-to-table culinary experience. When we arrived, we were immediately set up to do the Hook and Cook Tour, where guests get to catch fish which is then filleted and cooked by the restaurant for guests to consume. So the incentive for us to catch fish was high! With all the fishing paraphernalia in tow we sought out for our fishing expedition. A little background on Rushing Waters Fisheries; has been around since the 1960s and is now one of the biggest suppliers of fresh and frozen seafood to Whole Foods. 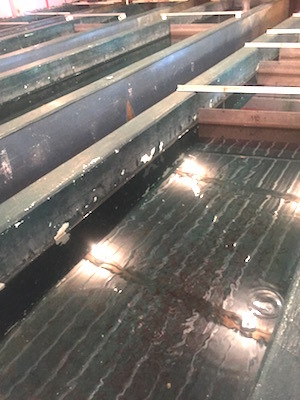 The tour of the harvest ponds and hatchery further confirmed the sustainable approaches the farm is committed to in raising its trout, including using only soy-based fish-feed, which ultimately better for the fish, the consumer, and the environment. Very impressive! After a gorgeous day of fishing outdoors and catching a good number of fish, we headed in to the restaurant where Chef John Bresser greeted us to talk to us about their new menu. Our tasting began with two of their about-to-be-featured drinks, both of which were remarkable. The Spiced Rum Cider with Captain Morgan, hot apple cider and cinnamon will be a fall favorite for sure! The Bourbon Cream Coffee was addictive with that bourbon cream liqueur, coffee and whipped cream. Both drinks were so good that it made me feel a little better about the upcoming cold weather. Chef was kind enough to send a sampling of a variety of seafood in smaller portions so we got to try a majority of the seafood items on the menu. I specifically asked to try Smoked Fish and Cheese Board again and it reminded me of just how much I love the fish charcuterie concept. The flash fried calamari came cream-battered and was crispy and chewy at once with a nice, zingy, warm marinara on the side. The Smoked Rainbow Trout Bruschetta was absolutely lovely and came on toasted crostini with cream cheese and a house-made tomato bruschetta. The balsamic drizzle gave it a little sweetness and I couldn’t get enough of these bite-sized snacks! The Sautéed Garlic Shrimp was juicy and sitting in a white-wine garlic butter sauce and was utterly flavorful! The Wild Gulf Shrimp were plump and freshly sweet. The Trout Chowder was entirely comforting! Intensely flavorful with perfect thickness and fresh fillets of trout mixed in. The soup was filling so I’m glad I asked for the cup! The Salmon BLT was unique and delicious! A trio of pan-seared salmon, tomato and bacon came together as one tasty sandwich with the bread slightly toasted! The honey glaze was also the perfect partner to the salmon. Chef urged us to try their Vanilla Cheesecake with house-made raspberry sauce and brought us a mini version of it. We obviously didn’t turn it down and somehow “managed” t o devour it! Everyone from Justin (our tour guide), Don (the manager), Carl (at the front desk), Chef Bresser to the staff wee extremely amicable and ready to assist in making this an unforgettable experience for us. 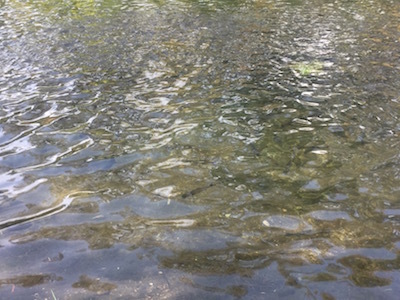 If you’re looking for a fun day activity or a min-getaway from the city, make the trip to Rushing Waters and enjoy some fresh fish. Because it really doesn’t get any fresher than this! I love being vegetarian when I can and usually am in the absence of fish. So I got down with the Portobello Stack with roasted red peppers, baby spinach and picante provolone on their housemade ciabatta. From their cold artisan sandwiches, I got to try their Caprese Sandwich (one of their most popular) and for someone who can’t stand raw tomatoes, I ate a few of the vine-ripened tomatoes it came with, because it was just so fresh. The Mozzarella, fresh basic and imported EVOO and balsamic vinegars from Modena were delicious on their crusty Italian baguette. The sandwich was gone in minutes! Another reason to be impressed is the sheer number of sides the restaurant offers, in small cups and perfect portions. I tried the Kale, Cranberry and Farro, the Fire Roasted Corn and the Broccoli Slaw and all three were marvelous! All are once again, made in-house! Another highlight for me was that they carry Martinelli’s Premium Apple Juice. If you haven’t tried it before, you must. Finally, they brought out their famous cookies for me to try and just to emphasize; they are all natural and made locally! Boar’s also carried a breakfast menu and will cater to events! Everything here is hearty, fresh and healthy. The restaurant is super clean and the staff uber friendly. A pleasant experience all around. Mora is taking over the world, y’all! I’d been to Mora Asian Fusion located in Plainfield a few months ago for a tasting, and remember being blown away at that time. Then a new Mora Asian Kitchen comes along at the Promenade in Bolingbrook, and I just had to check it out. Owner Jason Morales, has always been one of the most gracious hosts and was waiting for my guest and I, when we arrived. He not only gave us company the entire time but also talked to us extensively about his new restaurant. His philosophy remains to expand the brand but to give each restaurant location its own identity. He gave us quick tour of this four-week old, Filipino inspired restaurant, which sits right across from the theatre and boasts a large, gorgeous patio. With 90 degree weather that day, we most certainly took advantage of it. From their fabulous cocktail menu, the Ichomi Margarita and the Zodiac were our choices. The latter more akin to my taste, also because I’m biased toward anything with Elderflower liquor in it. The strawberry-mango puree and lemon juice were just the refreshing touch I needed in that heat. The Hot Mame (edamame) caught our attention, and I’m so glad we tried these boiled and sautéed soybeans in their chili garlic sauce. What a great way to spice up these little pods! The Brussels Sprout and Kale salad, a crowd favorite, and also my personal favorite, was just as delicious as I remembered it. The fried shallots on top added such a nice crunch and nicely soaked up the sweet chili dressing. The Pancit Noodles, also known as Filipino ‘good luck noodles,’ perfectly showcased flavors from this cuisine. Minus the sausage and pork belly (just for me), it came with egg noodles strewn in with shrimp, cabbage, and carrots all sautéed together into a juicy, delicious and flavorful dish. I definitely felt lucky! The Crab Cake dish almost looked like a product of gastronomy. Lump crabmeat (all fresh and authentic) combined as a patty, came sitting on a bed of green curry with fresh drizzled coconut. Chef Alex Millington personally brought it out to us, and I learned that the fish here is flown in directly from the Gulf of Mexico and Maine. No wonder the fish had sweetness to it. Chef Tiratt Pholaphat then took over for the sushi part of the menu. He was one of the first chefs at Sunda after all. After greeting us, he brought over two large trays of some of their most amazing sushi. Mora Asian Kitchen features more sushi than their sister restaurant and I was stoked about that. The Drunken Scottish with blue crab, salmon and bourbon Sriracha, and the Truffle Shuffle with tuna, salmon and truffle mayo, would be my picks for sushi here! Everything on that platter was beautiful in presentation and taste. The Little Lily Nigori sake from their extensive sake collection did wonders too. I’ve been on a sake kick lately and realize just how well good sake can contribute to sushi. For dessert, Chef Tiratt put together the Vanilla Mochi Ice Cream with Chocolate Mousse and the Blueberry Cheesecake, which came with a Lychee whip cream. Both desserts are made to order and take significant amount of time to put together. I told you everything here is fresh! I loved that they were not overly sweet and provided a delicate, sweet ending to our meal. Mora Asian Kitchen upholds the vision and philosophy of the original Mora restaurant in everyway possible. Everyone eat this restaurant is eager to serve, the owner is involved hands-on and with such a sense of pride and passion for his restaurant and the Chefs cook with joy! All of that shows in the food, and no doubt, patrons leave with a smile on their faces. I now want to go back and try their new brunch menu, which I bet will also knock my socks off.